The focus on recurrent head and neck cancer (HNC) care is typically geared toward treatment with curative intent, but there are other issues that are important parts of the holistic care of these patients. 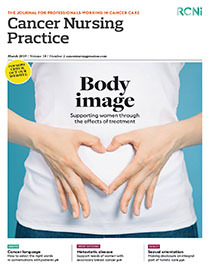 Patients might have concerns about their body image and sexuality, due to disfigurement and/or physical dysfunction related to their primary treatment. The aim of this study is to examine these concerns in people newly diagnosed with recurrent HNC. Thirty nine participants completed self-report measures of body image and sexuality, and demographic, clinical, disease and treatment information was collected from participants' medical records by research staff. Participants were mostly male, Caucasian and middle-aged, and more than half indicated at least one body image and/or sexuality concern. Different concerns about body image were noted by gender, alcohol and/or tobacco use, marital status and previous treatment for HNC. This is the first known study to examine concerns about body image and sexuality in patients with recurrent HNC. These are important quality of life issues, and must not be ignored in people with life-limiting illness. Nurses can help patients by asking open-ended questions, and creating an atmosphere that encourages them to express their concerns about these often-overlooked issues.